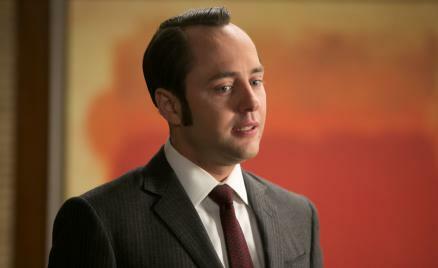 What is Pete Campbell up to? The episode kicked off with Kenneth Cosgrove getting shot in the face (and surviving, although we didn’t know it at the time; all around America people thought Oh my God, they killed Kenny). Kenny has featured in a series of increasingly horrifying cameos, culminating in this final defeat. The man hasn’t had much to do recently besides get beat up, get shot, and tap dance. I wonder if his physical battering is supposed to be analogous to the moral battering that the characters keep taking from their jobs and love lives. These people are as broken inside as Ken is on the outside. Ted Chaough, on the other hand, is suddenly deeply opposed to compromise; he is courting Peggy (though in denial about doing so) and wants her to do her best work on a campaign for … children’s aspirin. If it’s good enough—and maybe it can be, if the client is willing to spend money—Peggy will win a Clio. Peggy is surrounded by birth. (A better word might be haunted.) And by Ted. She’s doing an ad for St. Joseph’s children’s aspirin, working with a man for whom she has strong feelings, and her commercial is riffing on, of all things, Rosemary’s Baby. * Under the thinnest pretext she and Ted go see the movie—the choice of a Polanski-directed film will be catnip for the Megan-is-Sharon-Tate conspiracists—and get caught out by Don and Megan. It’s an early viewing; Megan notes that they were hiding. Movies are where Mad Men characters go to hide. Rosemary’s Baby is about deception, about the vulnerability of women and the predatory, even Satanic nature of the very rich. Which makes it perfect fodder for this show. At the end of the movie Mia Farrow is finally reunited with her child (and Satan’s!) and her maternal instincts take over. A lesser show would probably show Peggy sobbing in the bathroom, but there can be an enormous, sometimes infinite distance between cause and effect on Mad Men. We may be reminded of Peggy’s pregnancy by the interstitial ads that confuse us when we try to fast-forward past the commercials, but it isn’t on anyone else’s mind. Kenny wanting off of Chevy means that Pete sees a way onto the account. He wants to schmooze in Detroit, but is informed that he’ll be working with Bob Benson, whom Pete is convinced made a pass at him. This sets into motion a confrontation, in which Bob shows some spine. Pete: “So you didn’t profess your love to me?” Bob: “Only my admiration, which is waning quickly.” Although see this excellent breakdown of Bob’s sexuality for a different context. That confrontation sets off a wave of research into Bob’s past, and we learn very rapidly that Bob, like Don, is a completely invented person, and is in fact a nobody from West Virginia. No blue-blood, he worked in private banking as a personal servant, which is where he picked up his impeccable manners. Hanna, you pointed out that Bob makes a perfect Nick Carraway, but here his story is exactly Jay Gatsby’s—signing up to see the world on Dan Cody’s yacht, and transforming himself from Gatz to Gatsby by pluck and criminality. All that’s missing is the bootlegging. And, of course, the incredible wealth. Pete once went to war with Don and lost utterly, but this was a very interesting move because, well, Pete won. Bob was ready to clear out, to vanish. Maybe Pete is growing and realizes he can get along if he doesn’t push away the people who are kind and caring toward him. Or maybe Pete just wants to unleash Bob and see what happens. Or maybe it’s both. Perhaps Bob is Rosemary’s baby. There’s been a lot of this sort of Bob/Pete detente this season. (Anyone have any thoughts as to the title, “The Quality of Mercy”? Is it about Pete and Bob? Is Pete the Shylock of Mad Men?) Don and Ted agreed to collaborate; Don and Sally found some sort of compromise through a closed door. If you can’t love one another you can agree not to hurt one another. And there’s also an acknowledgement: I see you. Don may see Ted, to Ted’s discomfort, and he can see Peggy too. But he won’t see Megan. Perhaps it’s his guilt over Sylvia Rosen, but he literally turned her off when she appeared on his television. “I’m talking to you,” said her character. “Don’t you dare ignore me!” Click. Later he ignored her entreaty to come into the bedroom. He’s slipping, getting less and less visible, and she’s gone almost transparent to him. He’s spiking his orange juice. When Betty tells him Sally wants to go to boarding school he just offers to pay, whatever Sally wants. Of all of them, Sally seems to have her head best on her shoulders. She can’t bear to be with her father after walking in on him. She finds her mother intolerable, with some justification. She needs desperately to be anywhere else, but she isn’t the type to disappear. She doesn’t want to go live in squalor in the East Village. She knows that she’s still a kid. Says as much, even. So she chooses boarding school. I went to a boarding school—mine was for poor kids, so I didn’t experience the mix of privilege and cynicism that’s on display here. That said, I’ve known people who did go to the fancier schools and it seems the experience has some universal qualities. Boarding school compresses adolescence into its pure, aggressive essence. The hazing, the rituals, the sneaking through windows (we called it “hooking out”)—there’s a society of teenagers separate from any other society. The school functioned in place of parents. Which meant that you were mothered by a bureaucracy. You succeeded by navigating that bureaucracy, routing through the rules, if you could figure out what they were. I guess in these regards it was a lot like a regular high school, but it was high school at night, too, when your peers would wake up and wander like ghouls. (I have a memory of being awoken after midnight by a housemate who was simply unleashing fire extinguishers in sleeping people’s faces.) Vulnerability was weakness, so you became good at hiding things, both physical and emotional contraband. In that situation “home” became a very fluid concept. That’s why it rings very true to me that Sally would want this. The idea of home and family for her has become insanely complex, abstract, basically meaningless. Those girls hazing her, bringing her out, testing her—there’s actually an order there, amid all the teen bleakness. Seen one way it looks awful, but situations involving drugs and booze and a sexually aggressive boy are pretty typical to that age, not to mention that era. It’s how you handle it that counts. Sally got drunk but didn’t get high, she shut down Rollo and called him on his behavior, she called Glen to her rescue (does anyone have thoughts on his jacket? ), and she impressed the hell out of her temporary roommate. She didn’t get caught, either, which is absolutely critical. All of these behaviors are valuable in a boarding school, but they’re also valuable at Sterling, Cooper & Partners. Sally may spitefully claim her father never gave her anything, but she is her father’s daughter. Perhaps this is a place where she can thrive.